The final day was once again at Oksasenkatu 11, and featured a performance by Jeffery Byrd from 10 a.m. through 5 p.m. 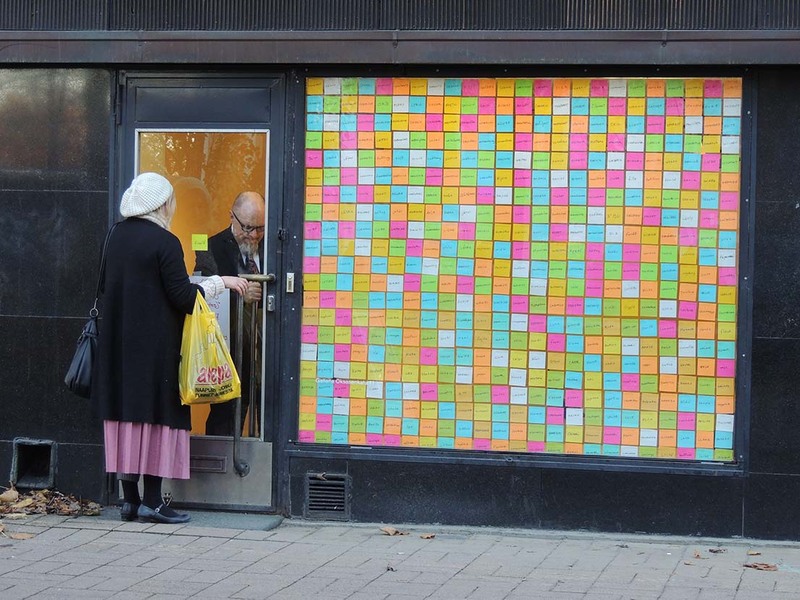 He wrote words, selected for their beautiful sounds, on colorful post-it notes and stuck them to the gallery’s storefront window, eventually filling it up. Unfortunately, there weren’t as many visitors that day. Those who did come could suggest words, and he would add them to the window. He was happy to talk, and we chatted throughout the day. I offered several words for his notes. He ended a little early, and the gallery attendants weren’t there at the time. The door seemed to be locked, and we couldn’t get out, and spent an extra hour just hanging out in the gallery together. Eventually one of the gallery attendants stopped by and left us out (embarrassingly, it turned out that the door was just stuck, not locked, and we could have left at any time). Here, Jeffrey unsuccessfully tries to open the door (I couldn’t open it either). While this performance didn’t foster the same kind of boot-camp-like mutual bonding experience as the previous day, it had its own closeness fostered by our daylong conversation and Jeffrey’s own interest in sci-fi culture. It was a good end to my series of performances. They dished it out, and I took it. This entry was posted in Uncategorized on November 22, 2013 by corporaloutis. The last two days were both in Oksasenkatu 11, a white-walls-style art gallery, and mostly took place in its small front room, with a storefront window onto the street. Once again I missed the beginning of the main performance by Peter Shaw, which ran from 10 a.m. until about 8 p.m. 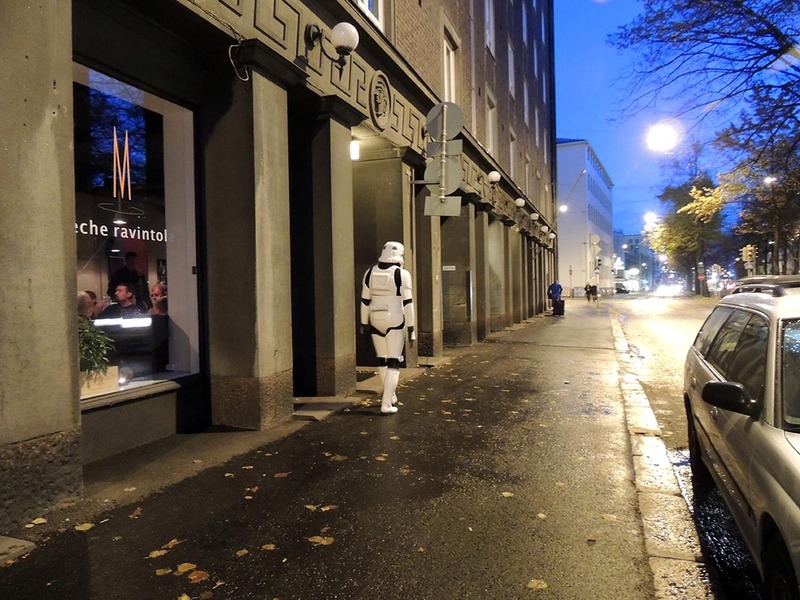 I got lost trying to find the gallery and unfortunately there’s no space for a cell phone in a set of Stormtrooper armor. I arrived around 11 and saw the rest of the performance. Peter created a set of clothes out of chicken wire and pulled it tightly around his body, then put on an all-blue set of clothes on top. This took most of the day. During that time, people wandered in and out of the gallery, but there were never more than a handful, and the gallery was often empty besides the two of us. The gallery is perhaps 15×20′, so it was close quarters. I felt like I was right on top of him, and since it was often just us, our mutual presence was impossible to ignore. At first, I think he felt uncomfortable at my presence, and couldn’t ignore me as much as he wanted; I was basically interfering with his headspace. 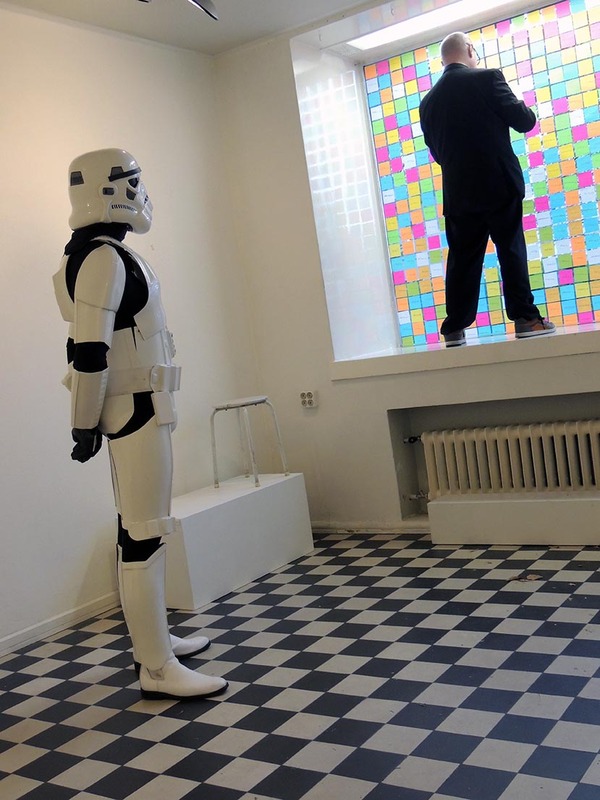 It must be a strange thing to be alone in a room with a Stormtrooper watching your every move. He was also not talking, so it was very silent. As time wore on, however, we started feeling bonded together in the experience, and sometimes conversed. Eventually, Peter finished his suit; about 20 people showed up to watch at that point. Then an experimental music group, the Krachkisten Orchestra, put on a music show in the basement. I took pictures with most of the band and we had a good time. At the end of the music show, people sang the Imperial March a capella, which was very gratifying and entertaining for everyone. Then Peter started the final phase of his performance: walking a few miles to one of the other galleries in the Festival while wearing his chickenwire suit, which was very stiff and painful. Unfortunately, while the crowd had originally seemed poised to go with him, in the end only a couple members of the Festival staff and I, and my own traveling companion, went along. It took two hours, and was freezing cold. When we finally got to the end, it had been an exceedingly long day, and we were all tired and cold. Peter stripped off the chicken wire as we watched, which was the finale of his piece. We all felt like it had been a great bonding experience. He had, I think, transformed to being somewhat uncomfortable with my presence to being grateful for it, as one of the only people to see it through to the end. For my own part, I really felt the power of the end of his performance, having watched so much of it and having participated in the marathon at the end of it. It was a shared feeling of exultation. My performance on Day 3 was very satisfying. I traveled from Estonia to Finland via ferry the next morning and arrived a few minutes late, missing the beginning of the next performance. 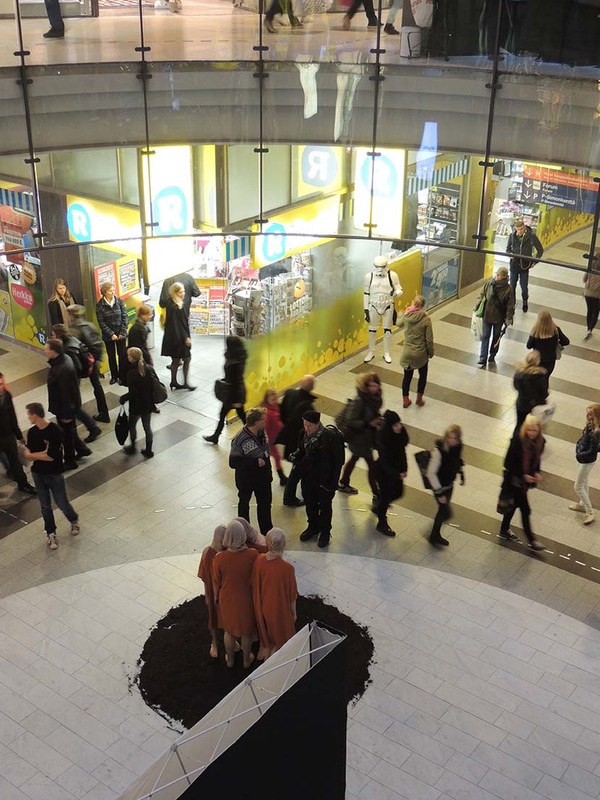 Day 2 featured three long-term performances, all in a “public square”-style space in the Kamppi Shopping Center, a major upscale mall. The first was Philip Levine, who stood on a pedestal and wore diamonds all over his scalp in place of hair. He was there for a few hours. The second was a twenty minute performance by Francesca Fini, who attempted to apply makeup to her face while her arm muscles were randomly stimulated by electrical devices attached to her body. There was also a short performance by Meri Nikula, which I had to skip in order to tend to my armor. The third performance was by Rooms, a group that sung numbers in order, with the sound for each number lasting as long as that number is, in seconds. This also lasted a few hours. This performance went completely differently from the first. The mall setting was radically different from the darkened abandoned factory, which was attended mostly by other performance artists. This was a well-lit, commercial space filled with shoppers who had no idea they would run into some performance art in the course of their day. Some of the artists were much more interactive with the audience, and with me, so I built up a relationship with some of them that did not exist with the artists on the previous night. In general, these circumstances made for a much more interesting series of conversations and experiences for me. Philip Levine was the most interesting. He and I were both just standing there the whole time. He had already applied the diamonds to his head, and was just there to talk to passersby. I stood perhaps thirty feet away, at about a 30-degree angle to his left. As he discussed his work with people who stopped by, he often pointed me out and sent them over to talk to me. I did the same thing with people who stopped by me first. It was a very symbiotic relationship. 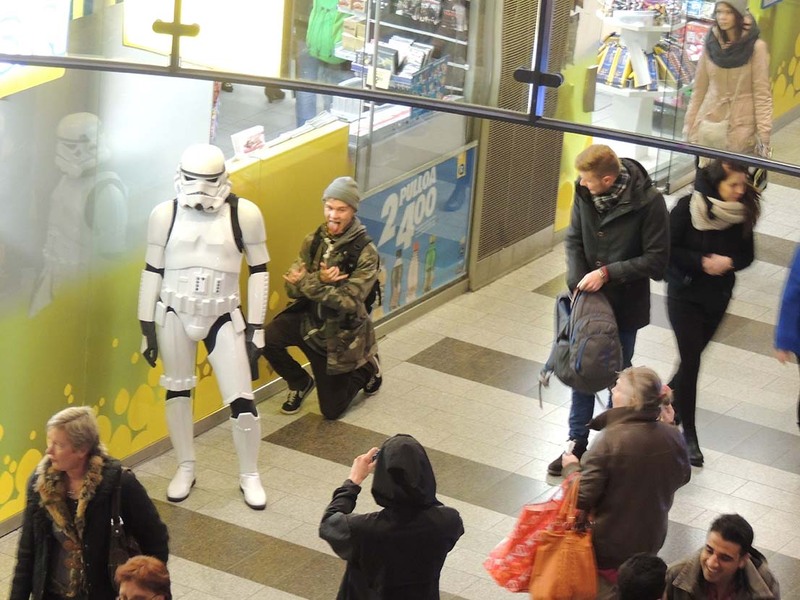 The people in the mall very very excited and interested to see a Stormtrooper, and excitedly talked with me and took pictures with me. 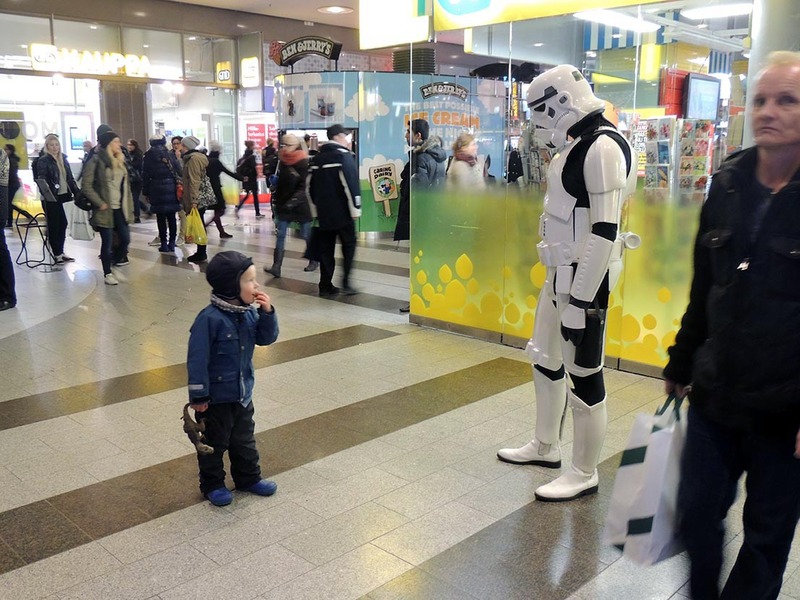 As the day went on, the mall’s visitors changed somewhat demographically. In the morning, they were mostly adults and younger kids. As the day wore on, there were more and more teenagers, who reacted to me somewhat differently. Sometimes they were just excited to see me, but other times they felt a classic teen need to deal with me in some sort of ironic or jaded way, making handsigns behind my back and so on. The second show created a bit of a stage, roping off the center performance area, and people gathered together to watch in a crowd, as they had not done for Levine. I simply stood along with the rest of the crowd. The Hours stood in the central area, but it was not roped off. They gathered somewhat of a crowd as well, but since it was a longer performance, and it was less clear what they were doing from the point of view of a casual observer, people usually only stayed for a short time. I moved around more during this performance, watching them from different angles and distances. At one point, one of the Hours’ off-duty members asked me to watch from a little farther off, as people had started wondering if I was part of their performance. I had expected that this might happen at some performances, and was happy to move back a bit. I felt like I had somewhat of a symbiotic relationship with them, but less than Levine’s, since they generally were also a somewhat theatrical, non-interactive performance, and the mall was pretty packed at that point. Overall, it was an interesting day, in terms of my relationship with the artists, and also with the rest of the audience. Since it was a commercial space, most mall visitors seemed to think I was just another independent event, possibly commercial or pop cultural in nature, and not necessarily related to the performance art world. It was nice to see the entirety of each performance, which certainly no one else did. Interestingly, the only other people who saw nearly as much as I did were the festival staff, who were there to help the artists and intervene with the shoppers when necessary. Since we shared the same long-term view of each performance, we often ended up chatting about the show throughout the day. Each day’s performances proved to be a little different from each other in interesting ways. The first day, which was in Estonia (the rest were in Finland), was unique in that the show I watched was a number of short performances rather than one long performance. Altogether it ran several hours. The show was in a semi-rehabilitated abandoned factory called the Culture Factory Polymer. There were at least ten performances and installations, most occurring on a stage in a room with formal seating and standing room. I stood among the rest of the audience and watched the entire show. It was generally theatrical performance art, in the sense that they were doing a show and not interacting directly with the audience, so the rest of the audience was fairly passive. I clearly stood out among the rest of the audience, but the house lights were often down and people mostly ignored me. 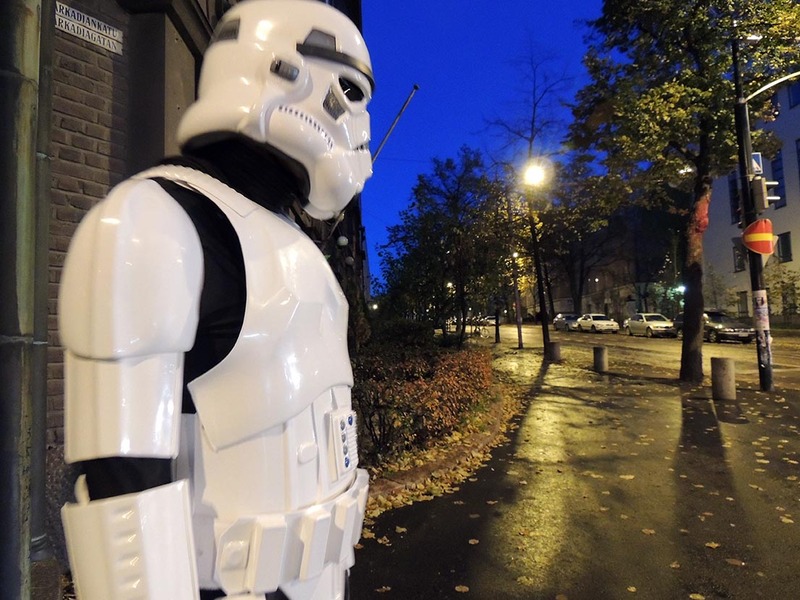 Occasionally people came up to talk to me and we talked about my project, the other performers, and Stormtroopers. They enjoyed the project and took pictures with me. There were a few other events in the rest of the building, but the performances on the stage were the main event, and most people stayed around to watch for at least a few performances, which lasted between 20 minutes and an hour. As the night’s events went on, the crowd thinned, until there were only a handful of people left to watch (earlier on the room was packed). I continued to watch, of course. Eventually, the program changed to a series of videos, instead of live performances. I decided to leave at that point, as my performance is really about the relationship between me and the other live performers. There were a few things that stood out. Since my mask does not reveal my expression or emotional reactions to the performance or to people’s conversations with me, I am a blank slate that can be either unnerving or easy to project onto. Even though everyone else is putatively just sitting there watching the performance alongside me, my lack of affect sometimes made them nervous. My opaque lenses also make it look like I’m continuously staring without even blinking, creating a further oppressive, sentinel-like effect. 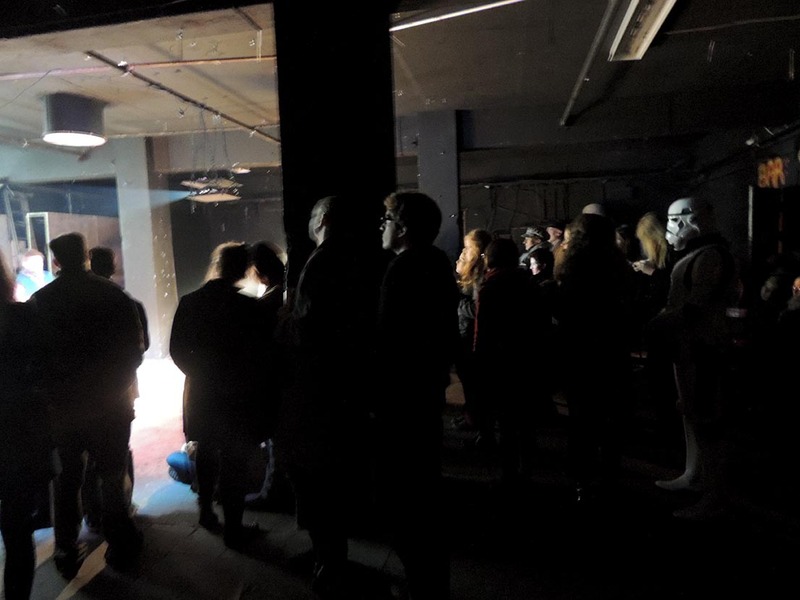 Generally speaking, however, I had a more passive role this night, compared to the other nights, since the space was pretty roomy, audience was usually fairly large, and the artists were set off from the audience by the stage space. In October, I participated in the Dimanche Rouge Performance Art Festival in Finland and Estonia with a performance called If You Can Dish It Out, I Can Take It. 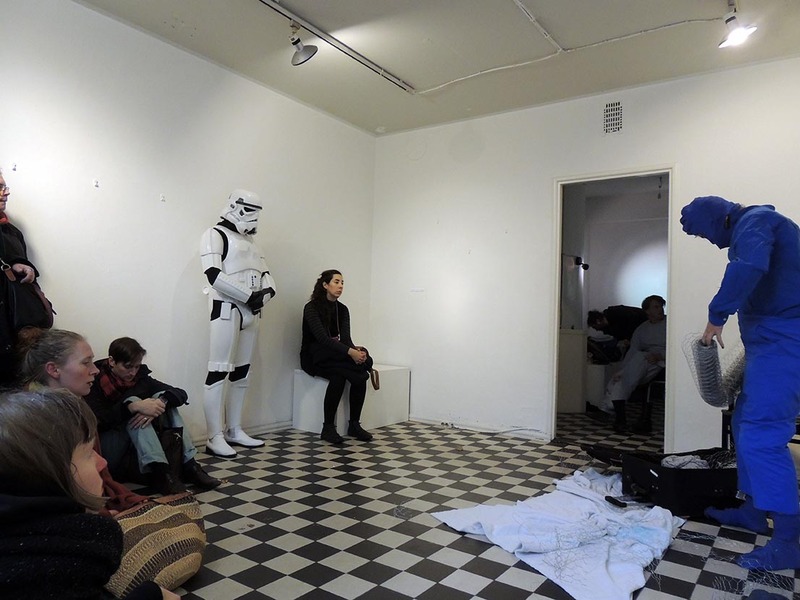 For my performance, I (as Corporal Outis) simply watched other people’s durational performances. I was basically just a member of the audience, watching each performance from beginning to end. 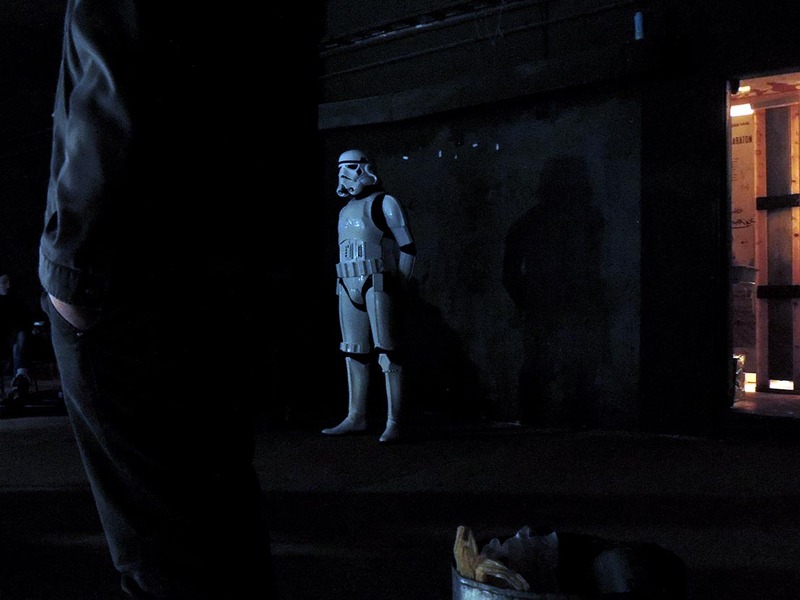 But due to my continual presence, not to mention my salient physical presence as a Stormtrooper, I transformed the role of viewer from a passive post to a more active duty. In effect, I put the other people’s performances under continual surveillance. I also became something of a partner to some of the performers, who enjoyed my presence as one of the very few, if any, viewers who saw the entirety of their performances. All of the artists whose performances I watched were willing participants in my performance and agreed to let me watch them. I will detail each day of the festival, and each other person’s performance, in separate posts.